This blog teaches you two ways of making compost. It gives a detailed description of how to make quick and slow compost. What you need, how much you need and what type of construction you need. What you basically need to make a compost heap is three types of organic material: brown material, green material and manure. Brown materials are dried weeds, hay, straw or dried or rotting leaves; green materials are fresh greens, herbs or grass; manure which can be from any animal, even from humans. 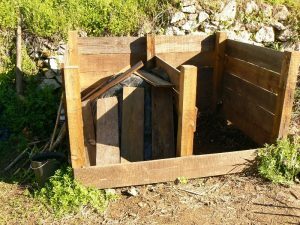 If you want to use humananure (from a compost toilet) for composting make sure it is pre-composted on its own for 9 month. This way you get rid of all the pathogens that can be in human faces, which can make you ill.
You can also mix your kitchen scabs into the compost heap. They will probably be some kind of mix of the first two, brown and green materials. Other things we mix into the compost are a bit of lime, wood ash and some clay. If your soil has clay, you can also add a bit of soil. I use the special clay from the cat litter box, the one that makes the lumps. I use this because our soil has very little clay. What you exactly use depends on what you have on your site. So have a good look around to find what you have available, you will need quite a bit of everything. Construction and site of the quick composting heap. 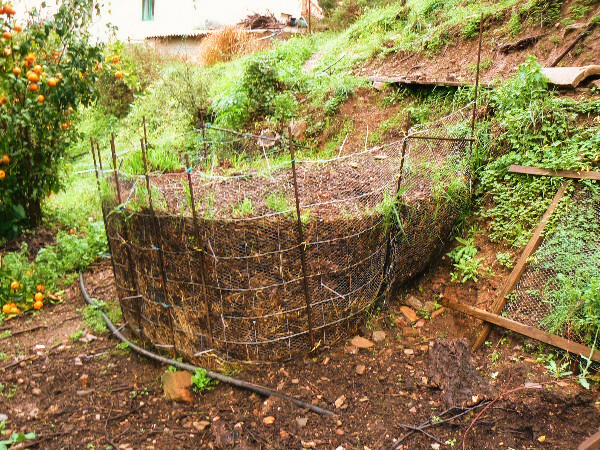 The construction of the slow composting heap. If your compost is well made and mature you can not use too much. When you notice that plants in your garden get signs of over fertilisation It usually means the compost was not mature. So you might have to adapt the process. Ideal is to put a layer of 2 cm of compost on your garden beds every year. In our 400 m² vegetable garden which is organised in 1.20 m beds and 60 cm paths we need about 11 m³ compost to have this layer of two cm in the whole garden. Some things, like potatoes we do not give compost but fresh manure. That saves us making some m³ of compost. It is worthwhile to keep a compost plan of your garden so you know which part had compost when. It is easy to lose track because usually you can not make all the compost at once, unless you have a small garden. Since you might not have all the material at hand for making one heap at once it is not a problem to collect things first in separate heaps. Only the green stuff needs to be fresh, but the collected older green stuff can be used as brown stuff. We make two types of compost, one quick compost that takes 5 weeks to be ready and a slow compost that takes 6 month. Here are two ways of making compost described. There are some other ways which I find also interesting. Making compost with chickens is one of them. We do not have this system (yet), but Geoff Lawton did some pretty nice experiments with this method. Here is the video. There is also one method that provides compost in 18 days, interesting, but I find it a lot of turning in a short time. Besides this, you need to stick to a tight schedule which can be problematic in our case, but might not be in yours. Here is an article about this method. For the quick compost we constructed a frame with two compartments, each one has a volume of a cubic meter. The frame is made of old planks, we brushed on a layer of line seed oil to slow down the rotting of the wood a bit. It will be eaten in the end, we know. That is okay for us, we will make a new one every so many years. I did not use branches or bamboo because my fork, I turn the compost with always gets stuck between the branches, this way I ruin the construction very fast. So sheets or planks work better for me. Just use anything you like as a material. Important is that the heap stays together and does not wash or blow away. You will have to make two compartments next to each other so it is easy to scoop the heap from one to the other. Around the heap I have some extra space for collecting material that goes into the next heap. I also make some space where I can put things like sunflower and cabbage branches so they can pre compost and become soft before they go into the main heap. So I start building a m³ of compost which in the end this will shrink to about ⅓ of a m³ . I build up the composting heap by making layers of brown and green material and manure. I start with a layer of brown material then add a layer of green material and then a layer of manure. These layers are about 8 cm thick. After that I sprinkle a bit of lime, clay and wood ash on top. I repeat this until the material is finished. In total I use 3 full big bags of manure, the 30 kg bags where you buy the animal fodder in. Then I use two equal parts of brown and green material in total. What exactly you put in depends on what you have, but what you put in will influence the end result. When you put in nitrogen rich material this will make your compost richer, therefor we like to put in green material that is rich in nitrogen, for instance lupines. I use lupins in the vegetable garden, a nitrogen fixer, as a green manure and when they get too big (not too big, then they become woody) I pull them out and put them in the compost heap. The same for the brown material, in autumn I like to use the Alder tree leaves, another nitrogen fixer. So you could if you wish, grow stuff in the garden that is good for the compost heap. Comfrey is an example. We do not have it because it does not grow well in our climate zone, but it might grow in yours. The lime that is added balances the pH, it needs just a view hands, not too much. You do not want an alkaline compost heap since most plants will not like that. Cabbages, which do like lime can have some more when you plant it. Potash comes with the wood ash, I think I add about halve a 10 l bucket of wood ash, again not too much. Another thing you could add is urine, it contains valuable phosphorus. Wee in a bucket dilute it 1 to 8 and you can pour it in and over the compost heap You can also use it to fertilize any plant you like. It is incredibly potent. What the clay does is a bit of a mystery to me, but it really improved the quality of the compost. There are also some things that you do not want in your compost heap. When you add grass cuttings be careful to spread them through the heap so they do not form lumps that are not digestible. Make sure all the material is soft. If you put in branches or woody herb or cabbage stems turning the compost heap will be a nightmare. The woody bits intertwine. You want to be able to scoop out the heap little by little and not in big pieces that are to heavy because of the intertwined woody bits. Now comes the crux of the compost making: the amount of water you need to add. This is not easy at all. It is important in order to get the right circumstances for an aerobic digestion in the heap. Too much water will suffocate the microorganisms you want in your heap and favour the once that you do not want. When the the heap is to dry it does not work at all. It depends on the weather conditions and on the material you are using and how humid this material is. Grass, dry weeds, hay and straw use quite a bit of water in the composting process. The best is to add water while you are building up the heap, to make sure that the water is also in the heap. Adding the right amount of water is something you will have to find out by practising. And even after a lot of practice it can still go wrong. You simply do not know all the weather conditions ahead. In dry weather you might give it a good go and then the weather changes and the heap turns out too wet…. This is how I test whether the amount of water was right or not: when the soil sticks together like a cream it was to wet, when there are ants in the heap it was too dry. The end result should be smelling like forest soil. If it does you know the amount of water was good. When it rains a lot I cover the heap with some plastic against too much water, when it is too hot I cover it too, so the water doesn’t evaporate. You will have to play around with it for a while to get it right. I leave the heap for a week, because I go to the garden once a week. It works good for me and for the compost. After a week I scoop the the layered heap into the other compartment so everything gets mixed. During 5 weeks I repeat this every week and then I sift and use the compost. If you want to do this more precise you can do the following. Buy a compost thermometer. This is a 40 cm long thermometer that you can push into the heap to measure the temperature inside the heap. After you have made the layered heap it starts heating up inside. It takes a day or two but then it really goes up. As soon as the temperature hits 55°C you turn the heap. Then wait until the heap warms up again and when it hits 55°C, turn it again until it stops doing that, which should be 3 or 4 times. Compost making is all about feeding microorganisms. Because you create an optimal situation for microorganisms to grow, which is what you do. When you build up your heap in layers, you are practically setting the table for them. Once your heap is set up the feast begins, and this creates the heat in the heap, just like a party. But it can also overheat, just like a party. That is why you stop the heap from heating up further by turning it in time. This way you keep the optimal circumstances for the microorganisms to grow. The active compost that you are making contains all the ingredients that the soil in the garden will need to feed your plants. It contains many microorganisms that help to transform the minerals and materials in the garden soil into edible portions for the plants. That is why good compost works so well. You are not just spreading homemade soil, you are spreading live. I think that is amazing. Some compost makers think that heating up the heap to 55°C is not enough. It should be at least 60°C they say. At 60°C all the weed seeds that are still alive in the heap will be killed, so you will not spread weeds with your compost. This is hard to achieve if you do not have a professional installation. I think it is questionable too. I Weed my garden any way and I have not noticed an extra amount of weeds because I am spreading my compost. If you want to raise seedlings you can pasteurize the compost before you use it. Not everybody sifts the compost since it a quite a bit more work, but I found out that it works much better in the garden. For this I made a sieve from some small square planks and a piece of rabbit wire. I make it so it fits on a wheel barrel, so I can easily bring the sifted compost to the beds. The pieces that do not pass the sieve, I through into the next compost heap I am making. Compared to the quick compost making this is a lot less work, but it takes longer too. It is basically the same thing but you just leave the layered heap untouched for halve a year. This is how we use this method. In our goat place we use a system that is called deep litter. We clear out the goat place twice a year. After it has been cleared out, a thick layer of straw is put back on the floor of the goat place, when this layer is starting to soil we put in another layer. We keep the top layer fresh. The layers below the top layer start composting, it is always nice and warm in the goat place. When we clear out the goats place we already have the brown material and manure mixed. And it is already pre composted. So we pile the compost heap in layers of stuff from the goat place and with green material. We make sure the composting heap has enough water, this process needs more water than the other, I am not sure why. Maybe because of the straw that is in the heap, but that is just a guess. We support the pile with a construction as you can see in the picture above. The terras above the heap is used to pour the goats place litter into the construction. The construction is made of concrete reinforcement iron rods hammered in the ground in a semicircle. Then we fix ( with tight ribs) a piece of goat fencing in the inside, and on the inside of the goat fencing we fix a piece of rabbit wire. This way the compost stays inside. We make sure the whole thing is fixed to the terrace bank so the chickens will not be able to get into the sides of the heap. If they could they would undermine the whole heap. It is okay if they roam around at the top since the heap is well contained. Again like with the other heap, you can use what you have available, for us this is a cheap well working construction. This is how we build up this heap. One person stands in the construction to organise the layers. Two or three people empty the goat place and carry it to the compost heap. The amount of water we have to add depends a lot on the weather conditions. But by experience we know it uses a lot. We spray water on almost every second layer, with a garden hose. The layers are thicker then in the quick composting heap, about 10-15 cm. After the heap is build up we leave the heap open since we discovered that works best. In summer we irrigated the compost heap together with the trees around it, without this irrigation it gets too dry. After halve a year we use the compost. It works as well as the quick compost. You can also sift this compost before use. If you want to make your own composting heap you will have to translate what we do to your own circumstances. There is not a site the same. In cold climate zones the whole composting process stops in winter because it is too cold. In tropical areas the process will be much faster and you might not need to pre compost branches and stems. You might also be better of using bamboo instead of wooden planks since the termites will eat the planks. In climate zone 9, where we are, we can make compost the whole year but we need to water the compost heap in summer. As long as you get the principle idea you can work it out. I hope you enjoyed my blog. Feel free to send me an email when you have any questions. We would love to help you. If you want to give some feedback be welcome especially when your experience is very different from ours. Making the perfect compost is a big debate after all. Would you like to follow our activities on the farm on a more daily basis, please follow our Terra do Milho facebook.